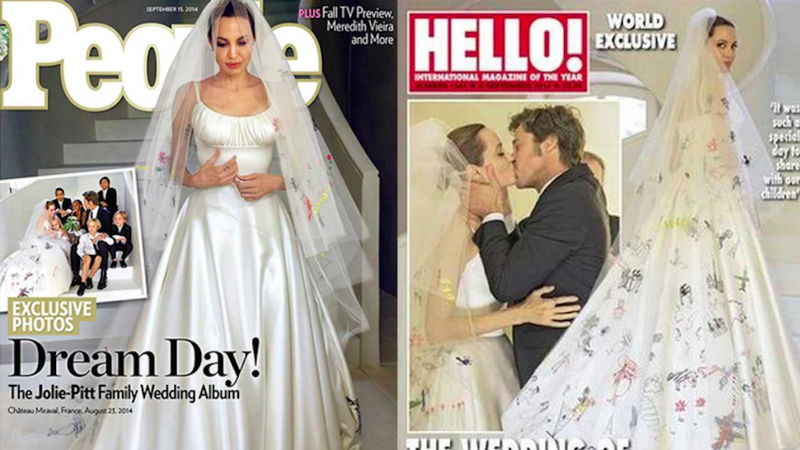 Brad Pitt and Angelina Jolie finally got married—fulfilling the wet dreams of tabloid editors around the globe. Now that the initial shock has worn off, we are in a better state to process what "details" People has released in the run up to their full story, on newsstands Wednesday. The couple granted an exclusive with People and Hello! magazine, revealing carefully selected particulars of their private nuptials. Reading through, it is hard not to notice the saccharine quality of every anecdote provided by the couple. The result is the Brangelina clan coming off as the most sweetly loving and happy group of beautiful humans the world has ever seen. Here we've ranked the sweetest moments, from "awww" to "legit dental emergency toothache." Getting married in a chapel that rests on the grounds of one's French chateau reads like something out a Fifty Shades of Grey meets Pride and Prejudice fan fiction novel. I find it interesting that there were no other ties to choose from on the entire estate, but I will overlook that logical flaw as it allows for this lovely father-son anecdote. Can't you just see it? That kind of choreographed cuteness must come naturally when you're a Jolie-Pitt. CAN YOU STAND THE ADORABLENESS? ARE YOU ABLE TO PROCESS IT ALL? Little Knox practicing his ring bearer duties with acorns collected from some magical French forrest like a Disney character. All of that and an adorable mishap during the ceremony? Oh, the charm of it all. You know that sick feeling you get in your stomach after consuming five too many Reese's Peanut Butter Cups? That. A wedding cake made by their ten year-old son—baked with love, no doubt. Shorts and a top hat! Shorts and a top it. Shorts. And. A. T op. Hat. They had Shiloh looking like an angelic Little Lord Fauntleroy. By the way, this is a quote in reference to their children. Everyone in the Jolie-Pitt family is BFFs and I actually sort of believe that. This is just...a lot and really requires more information. Was she humming it to herself also? Was it loud enough for the entire chapel to hear? Was that somehow preferable to just playing the actual song? Did anyone else join in on the humming? Elaborate, please. This veil has been the big story in all this wedding hoopla. On one hand, it undermined the simple elegance of her gown. But on the other hand, you can't really hate on her for wearing a veil filled with her children's artwork. *Shakes fist* that Angelina—she loves her children so much that she doesn't mind getting married in a veil inscribed with the words "Buttock Fatock." Brad and Angelina, I'm really happy for you and all, but you gotta dial it back a bit. I can already feel a cavity coming in. Image via People and Hello!